The ASC’s 2017 Report to Parliament found that the responsibility for managing surface water flooding is fragmented, mainly between water companies, highways authorities and Lead Local Flood Authorities (LLFAs). The analysis also concluded that it is unclear whether the actions carried out by these bodies are effectively tackling this challenge. 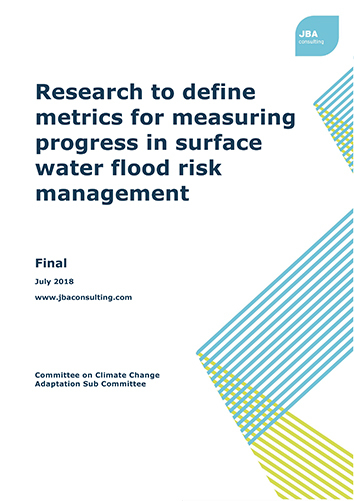 To help address this, the ASC commissioned research to define metrics to measure progress made in managing the risk of surface flooding at a local level, and based on the available data, collate these metrics to gain a national picture of the progress being made. This research, by JBA Consulting, considered the advantages, disadvantages and unintended consequences of existing and new metrics and attempted to prioritise these in terms of how critical they are to understanding progress being made in surface water management. The research also makes strategic recommendations for future assessments of progress at a national level.